rediff.com Special: Sheela Bhatt reports from the Indo-Pak border in Gujarat. There were some 450 of them. Rural people, men and women, from Sukhpar near Bhuj, gathered for another village meeting. "Havey to yudh aej kalyan! [Now war is the only solution!]" Bhuj belongs to Gujarat's largest district, Kutch, which shares a 310-km border with Pakistan. In light of the heightened hostilities between New Delhi and Islamabad, the villagers here have been preparing for war -- and the gathering was for that. "We are fed up of these killings," said Ramji Velani. "Why should our people die everyday? We are bleeding and they are laughing! We want a lasting solution. We will burn Musharraf's effigy to express our anger." Which they did. But before it was burnt, a few well-built women expressed their personal feelings for the Pakistani president -- with some resounding punches. Sukhpar, like most of Kutch, is populated by fiercely patriotic farmers. So is Nalia, where the villagers are excited about the heightened activities at the Indian Air Force station nearby. Air force officials had, in fact, convened a meeting here recently to prepare them for the eventuality of war. "We now regularly hear planes flying in the night. Twice we experienced blackouts too," said Satish Thakkar. Though Kutch has around 400 km of coastline, there is no naval or coastguard base here. It was only on December 8, 2001, when the shadow of war loomed large, that senior coastguard officials visited the area to draw up a plan for a new base. The topography of the Indo-Pak border in Kutch makes an attack here very difficult. By that same token, it is tough to defend it too. The border is a desert. During high tide, the waters from Sir Creek invade it, and do not recede fully during the low tide. In summer the residues evaporate, in the process leaving a bed of salt for the Border Security Force, India's guardians here, to man. "Kutchis salute these brave hearts who keep vigil in this salty desert," said Kirti Khatri, editor of a local publication, Kutch Mitra. "It's a torture on human body and mind. Just last month when 32 kg of RDX was seized on this border, we came to know how Lashkar-e-Tayiba militants bring in explosives through the desert." The Kutch border presents problem for logistics too. "Unlike the Punjab and Rajasthan border, Kutch is not populated," an army officer explained. "So when our jawans go into the desert, to the border, we have to make sure they have everything with them." "Nothing, nothing is available once you reach the borderline. There are no villagers there to help you," he added. Kunvar Bet is beyond Khawda village. Unlike Bhuj, where you don't feel the 'war-like' situation so much, Kunvar Bet is witnessing the 'largest-ever pre-war preparations in the last 30 years'. When the army moved heavy machines into the desert, word leaked out in Bhuj. "The villages are smart and very curious," said a police officer. "They wanted to know if bunkers and trenches were being made!" They are eager to help too. For instance, on December 2, a resident of Bhuj called up the army base. He said he had 200 bottles of blood, which he wanted to donate! People across the border, meantime, have started to migrate, an intelligence official said. "We are safer than them because our side is not populated," he said. "They have well-settled villages like Mara, Shah Bunder, Keti Bunder, Musafir Khana and Bhadami. Our villages like Khadir, Koteshwar, Lakhpat Zara, Hudko and Lyndro are not as close." The officer said about 20 per cent of villagers, mostly landed farmers, have moved out, taking with them their livestock, from the area manned by Pakistan's 206, Infantry Brigade. "We have suffered more than one would suffer in a normal war," said a young army officer, with many injuries during counterinsurgency operations. "Our jawans are ready to thrash the enemy nice and proper. We are ready for war." 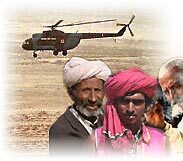 "We remember how our jawans won Nagarparkar, a border tehsil of Pakistan, in the 1971 war. The Indian flag flew there for a year. But all that gains were lost over a meeting table in Simla [when the Simla Agreement restored to Pakistan its land]. "We don't want politicians to lose the gains of our war on the diplomatic table. And we don't want the United States or the United Nations to tell us what to do once the war starts."